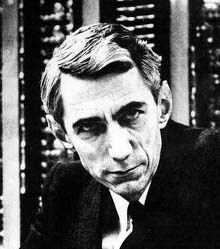 Claude Shannon was an American mathematician and pioneer of information theory. Shannon was the first to realize that any sort of message can be transmitted as a series of 0's and 1's, regardless of whether it consists of words, numbers, pictures, or sound. In his Master's thesis, he explained how electrical switches could represent binary digits – a 1 when the switch is on and 0 when it is off. He also used Boolean algebra to show that complex operations could be carried out automatically on these electrical circuits, thus manipulating the data they were storing. It was in one of his papers, "A Mathematical Theory of Communication" published in 1948, that the word "bit" (short for binary digit) was used for the first time. In fact the framework and terminology for information theory he developed remains standard today. Shannon was driven by curiosity, and in his own words he "just wondered how things were put together". Among his inventions were rocket-powered Frisbees, motorized Pogo sticks, a device that could solve the Rubik's Cube puzzle, and a juggling machine. (He himself could ride a unicycle while juggling three balls.) He was involved in pioneering artificial intelligence research, which included building the electromechanical mouse called "Theseus" that could navigate a metal maze using magnetic signals. Shannon also built a chess-playing computer, many years before IBM's Deep Blue, that played well against the world champion of the time, Mikhail Botvinnik (the computer lost only after 42 moves).